This program teaches that there is one thing that is common to every individual, relationship, team, family, organization, nation, economy, and civilization - one thing which, if removed, will destroy the most powerful government, the most successful business, the most thriving economy, the most influential leadership, the greatest friendship, the strongest character, the deepest love. On the other hand, if developed and leveraged, that one thing has the potential to create unparalleled success and prosperity in every dimension of life. Yet it is the least understood, the most neglected, and most underestimated possibility of our time. That one thing is Trust. Like the ripple in the pond the "Speed of Trust" begins within each of us personally, continues in to our relationships, expands into our organizations and ultimately encompasses our global society. In this live program, Covey teaches the 13 Behaviors common to high-trust leaders throughout the world and demonstrates actionable insights that will enable you to shift your behavior to increase trust in all your relationships. This is a really good Live seminar and discussion between the Covey's. 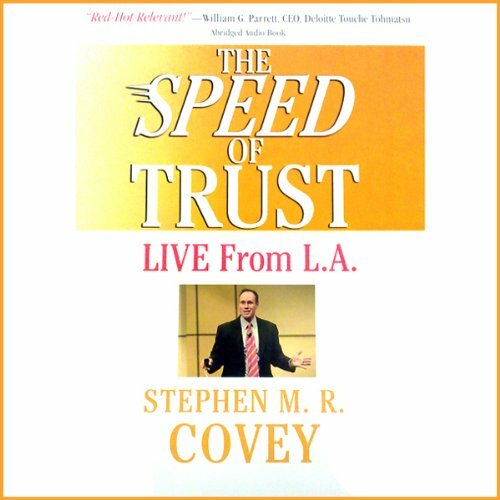 I can't wait for the full audiobook of The Speed of Trust. Got it. Much is repeated. I would suggest the action plan info is valuable if somewhat common sense. I did not like the chat on Audible version over the last hour or so. That was less punchy. The man's voice makes this almost impossible to listen to.. It was a little salesy, but good area to investigate - trust. This book flies in the face of our normal anti-trust paranoia. Whether you are considering this as a business executive, a member of middle management, a part of the labor force or as one trying to get a grasp on the complexity of family, I recommend you take the time to consider the ideas delivered in this message. I found this to be rather uninformative, repetitious and a bit dry. However, it does increase your awareness of how important trust is. What disappointed you about The Speed of Trust? I wanted the real book. This is just a watered down version, not the real book. Not sure I will likely cancel my subscription, what a frustrating experience. It's good, but it is a recording of a seminar. I would be up for the entire book on audio. I opener into the value of trust. I love this book. This will be a classic for me. The value of trust 20 years to build it 5 minutes to lose it I'll never forget it thank you Stephen Covey. I thought the book would be read. Instead it was just his speaking engagements put together. I thought it was pretty expensive for what was delivered. I looked up the book on Amazon and saw that they had a version available on audible. So rather than wait two days to get the MP3 cd version I said why not. About 2 hrs in the author's father starts talking about the book then I realize that the audio is almost finished and I only got a brief overview of what the content within the book (sounds like a seminar the author may have done) I'm upset because I can't find this book in my Amazon orders to cancel it. Talk about a major breach of contract In selling a this audible file on the same product page as the actual book.